Whether you’re shopping for groceries or a new outfit, shopping expenses can really pile up over time. So, why not start saving money as you shop? These money saving apps for shopping are easy to use and can help you save on the purchases you’re already making. It’s a total win-win! Click here to make some extra money right now! Some are as easy as downloading an app! Shopping around for someone to help you with your finances can be pretty expensive. Instead, consider downloading the free financial help app Long Game. Long Game is a savings account with cash, crypto, and slot game rewards that can help you stay on the right money-saving financial path this year. It helps you save money by making it fun! Sign up for Long Game Savings and start earning rewards for making smart financial decisions. This money saving app helps people save money while filling up on gas or food. Download the GetUpside app and find gas stations, restaurants and grocery stores with unbeatable deals. Not to mention that their cashback rebates can save you up to 25 cents per gallon on gas. Never pay full price for gas again! Swagbucks is one of the most lucrative money saving apps for shopping online. When you shop using the Swagbucks Search, powered by Yahoo!, you earn Swagbucks points with each search. You can then redeem those points for gift cards from thousands of retailers — such as Amazon, Target or Walmart — or get PayPal cash. You’re getting paid to shop, which is the same as saving the money you’re spending. When you join the Everyday Family community, you automatically get access to a wide range of family resources. One such resource is their Free Baby Stuff section which gives free samples, coupons and offers from top brands. Sign up for Everyday Family and get access to a ton of money-saving free printable grocery coupons you can use at stores near you! One of the most popular money saving apps for shopping is Ebates, which offers up to 40 percent cash back at over 2,500 stores. Arguably one of the easiest ways to make money while shopping is by doing your online shopping through Ebates at your favorite stores. They offer a check or PayPal payments which are given to you every quarter. Join Ebates now, claim your $10 signup bonus, and start saving money while you shop! One of the best money saving apps for shopping is Ibotta, a free mobile coupon and cashback shopping app compatible with most iOS and Android devices. When you sign up with Ibotta, you have the opportunity to earn cash back on select products by performing easy tasks, purchasing the product, then providing proof of purchase like a receipt. See our Ibotta Review for more helpful information. Click here to sign up for Ibotta, get a $10 bonus, and start earning money back on your purchases. We’ve all shopped around for cheaper subscriptions, Comcast bills and car insurance policies before. Save money doing this kind of shopping with the help of a pro — Cushion. When you download the Cushion app, it analyzes your accounts to find recurring subscriptions and also compares prices on current bills, letting you know about cheaper options. Learn more about Cushion by reading our Cushion Personal Finance Bot Review. This is an app for anyone shopping around for weight loss help. Losing weight can be pretty exhausting, not to mention intimidating, so it’s better to go through the journey with others who are supportive. HealthyWage is a platform that turns your personal weight loss challenge into potential cash prizes. Success stories and cash won are evidence on the HealthyWage site of how well the system works. One of the money saving apps for shopping you need to download right now is Dosh. It gives you cash back when you shop, automatically. Instead of offering points or coupons, it gives you the cash back in… cash! So, you can use it immediately, without any hassle. Just securely link your cards, shop or dine out, and get up to 10 percent cash back in your Dosh Wallet. Another one of the best mobile money saving apps for shopping you can try is Shopkick. When you download Shopkick, it rewards you for shopping both in-store and online. You earn reward points — called kicks — that you can then redeem for a wide range of gift cards to popular stores near you. So far, Shopkick users have earned $78 million in free gift cards! Another way to save money while shopping is by downloading the Drop app. When you download the Drop app, you earn points and save money while shopping online. Then, you can redeem your points for rewards at top brands like Uber, Amazon, Starbucks, Lyft, Asos, Netflix, and more. For those shopping around to rent a car, consider Turo your app of choice. Turo allows you to rent cars from individual car owners, often at prices far below car rental services you might find at airports. Search the app and find the rental car you’re looking for then save on the price difference between airport rental services and Turo’s service! Grocery expenses can seriously cut into a household budget. The SavingStar app lets you earn cash back by tapping then buying the current offers, such as Annie’s mac and cheese, Cinnamon Toast Crunch, Chex Mix. SavingStar works at nearly every supermarket chain including warehouse clubs like Costco, BJ’s, and Sam’s Club. The cash you earn is paid back via PayPal, gift card or directly to your bank account. Read our SavingStar Review 2019 for more information. This next money saving app is quite interesting, as it can save you money on your way to the shops. Waze is a driving app that focuses on community-based traffic and navigation. Its goal is to save people time and gas money on their daily commutes. For instance, it can navigate you around traffic and dead ends while also alerting you to the cheapest gas stations along your route. Another money saving app focused on getting you to the shops is Gas Guru. It saves your favorite gas stations, finds cheap gas near you and compares the best prices along your route. No need to spend extra cash when you head out for the day. Instead, download Gas Guru and save money when you fill up your tank. Save more money while shopping with SlickDeals. It’s a coupon site offering the best deals on items, opportunities and services. SlickDeals allows you to personalize your frontpage, meaning you can shop online with ease, making sure you’re saving money as you do. This money saving app is a lifesaver for people who need to buy prescription drugs. When you sign up for GoodRx, it compares prescription drugs prices and finds coupons for you from more than 60,000 U.S. pharmacies. You can save up to 80 percent! While you save, why not make some extra money on the side as well? Click here for our best tips. One of the more popular money saving apps where you can shop and cash in on deals is DealsPlus. Look through the DealsPlus catalog for coupons and sales occurring in your favorite stores nearby or online. No need to pay more than you need to when shopping! Looking for your favorite brands, styles and hobby crafts online? Take a look through Zulily’s selection and see where you can save up to 89 percent off the pieces of your choice. They specialize in everything from women’s and men’s fashion to crafts, jewelry, and home goods. Looking for a way to compare product prices as you shop? Download the ShopSavvy mobile app and you can do just that. This is one of the best price shopping apps out there, saving you money when you price compare barcodes from the products you love. If you’re looking for ways to save money while shopping or eating out in your local area, Valpak is for you. Valpak is a coupon site that customizes the coupons for your local area, meaning you can save money by choosing places to shop and eat which are currently on sale or cheaper. Choose the way of making money that best suits your talents. Click here to learn more! Do you eat healthy or want to eat healthy? The BerryCart app may be the answer! You can download the free app then start browsing their exclusive offers on food you can feel good about, such as all natural, organic, gluten-free and non-GMO kinds of foods. After you buy the product and snap a picture of the receipt, they’ll send you real PayPal money or gift cards within 24 hours. Want to save money while you buy groceries? Earn cash back with Checkout 51 and start saving money on the brands you already love to buy. Click “redeem” and check off the items you purchased on your receipt, take a photo, then get cash back in $20 increments. The RetailMeNot app is truly an all-around excellent money saving shopping app. It offers you online codes, cash back, coupons, and more. It also has a savings map that notifies you of all current deals near your location, so you can use it at home and on vacation! Do you plan out what you’re going to buy before online shopping or heading out to the stores? Then the Flipp app is great for you! Down the Flipp app and make a list of items you want to buy. Then it will find the stores with the best deals for you, saving you money before you shop! Click here for a comprehensive list of tips and strategies on how to earn passive income. Tired of carrying store loyalty cards? Do you lose them or refuse to get them because you don’t want the hassle of carrying them? Then the Key Ring app is perfect for you. It acts as a virtual wallet for store loyalty cards, meaning you can always get their rewards when you shop without the hassle of carrying the physical cards. Have you ever seen a coupon from a newspaper but didn’t have scissors or the time to cut it out? The SnipSnap app helps you out by allowing you to take photos of coupons and then converts it to a digital, mobile version you can redeem in store. Save money with coupons without cutting them out! A great money saving shopping app is Grocery Pal. It allows you to compare product prices across multiple grocery stores in your local area. In addition to finding you deals and coupons, it can also sync your grocery list across multiple devices. Win! You may not know this, but Target has its own app, Cartwheel. You can use the Cartwheel app to browse weekly or monthly specials and scan products in-store to learn more about them. It can also help you find where a product is in a store. Super helpful! Looking for assistance and cash back while shopping? Coupons.com can help you by storing your store loyalty cards. It can also give you cash back on your shopping if you take pictures of your receipts and upload them. While this isn’t technically an app, it can still save you big bucks. Honey is a browser plugin for Chrome, Firefox and Opera browsers that automatically applies coupon codes when you check out after shopping online. It also gives you Honey Gold points that you can redeemed for gift cards. Wikibuy is a browser plugin for Chrome and Firefox with an iOS version available for iPhone users as well. It looks for coupon savings you can apply to anything in your shopping cart. It also offers options to shop by store or by product for savings and points that can be redeemed for gift cards or specific items. Do you use Amazon for your online shopping? Who doesn’t, right? CamelCamelCamel is a money-saving app that price tracks across Amazon. By using the browser extension or website, you can see every product listed, as well as when they go on sale, allowing you to hold off if savings are in the near future. A new mobile app that can help you shop internationally was just released. Revolut offers you a personal money cloud with a multi-currency card which is accepted anywhere, meaning you won’t have to pay currency exchange fees. Save money while shopping in different countries now! If you love online shopping, this is one of the money saving apps for shopping you should definitely try. Create a personalized shopping hub with TheFind and save all of your favorite stores or brands. Then, it’ll alert you once your favorite products are discounted. Save money on what you love! Another great shopping app on this list is CoSign. When you share your looks online and tag products you wear, you can get commission if your followers click on it and make purchases. Commissions range from 5 to 30 percent with brands like Forever 21 and Macy’s. This money saving app helps you find a retailer’s best deal. Download Pricegrabber and get access to a price comparison service that can search online merchants. You can also scan the barcode of the product you desire and see how much it costs online, with taxes and shipping even taken into account! This shopping app allows you to create and follow feeds of people who have similar shopping tastes to your own. You can like, comment, and share products between you. Also, download Bestie and receive special promo codes from select merchants to save money while shopping. Are you a shopper who waits for the discounted price before purchasing? If yes, then Shop Advisor is the app for you. It can send you a notification when the price is right for any of the products you organize within their system. Looking for a great, cheap gift? Give the gift of gift cards. The Raise Mobile app allows you to purchase highly discounted gift cards from online sellers. This is one of the best money saving apps for shopping to use when you need that last-minute gift. If you’re an avid eBay-er you may know how annoying it is to be outbid at the last moment. Instead, Myibidder gets your chances higher for winning the auction, by placing a bid for you within those last final moments. No need to sit there waiting while Myibidder can do it for you! Want to save time and money while shopping? Redeemia can save you a lot of time by aggregating the best money saving deals and discounts from popular coupon sites such as Groupon and Living Social. In fact, it can even show you best offers based on your location and preferences. Trivago is the app for travelers who are shopping for accommodation. Download the Trivago app and get price comparison for hotel rooms across numerous hotel-booking websites, saving you money as you travel. Download the Kayak mobile app if saving money while travelling is something you’re interested in. Kayak compares many travel sites to find you the cheapest accommodations, flights and transportation fares. Save more money for your actual vacation with Kayak. This is for shoppers who know what they want ahead of time. The Poachit app allows you to flag all the items you want to purchase, then once they go on sale or an applicable coupon becomes available, Poachit will immediately text you to buy it while the price is low. Download the Yowza coupon app for money saving help while shopping. Unlike a lot of other coupon apps, Yowza gets their coupons and offers from retailers directly, often resulting in more savings for you. You can also score savings based on local-only offers. Tired of carrying around loyalty cards in your wallet but want the savings that come with them? Enter CardStar, an app that virtually stores your loyalty cards allowing you to have them scanned at checkout via your phone. Download Coupon Sherpa for both mall-type and grocery store retailer savings. The app searches for product-specific coupons throughout entire brick-and-mortar stores as well as at online retailers, offering you the best of both in-person and online shopping. After you find the coupons you need, just save them in the virtual wallet or print those where the store requires printed copies. If you do a lot of couponing for groceries, then the Grocery iQ app is perfect for you and can probably save you a lot of money. It allows you to create lists based on what you tend to buy, which means fewer impulse purchases. It can also store your loyalty cards so you can save money each time you buy. Here’s a money saving app for all of our readers in the U.K. and France. Shopmium is an app that gives you exclusive offers on everyday brands. Buy the featured products, if you wish, and receive up to 100 percent cashback paid directly into your PayPal or bank account! Click here for our comprehensive guide to couponing for beginners! For online shoppers looking to save money while purchasing locally, Yipit is a great money saving app worth your while. It shows you the best of the best each day for your location and profile, saving you the time wading through a million deals would take, and also saving you money by alerting you to current local discounts. Another app for the travelers, whether for vacation or business, Dayuse.com allows travelers to book hotel room stays between the hours of about 10 AM to 4 PM for 50 to 75 percent off the nightly rate. If you need a place to crash during the day, use Dayuse.com to shop for rooms at a cheaper price. Again, for those shopping around for a room to stay in, Roomer can save you a lot of money by allowing you to snag unwanted, nonrefundable hotel rooms at massive discounts. Look and see if you can find dates and times that work for you. Deals can be up to and sometimes even over 70 percent off the original room price! For travelers looking to buy the cheapest flights available, Hopper is one of the best money saving apps for shopping to use. It essentially sifts through airfares from 250 different airlines and highlights the cheapest days for you to fly. It also uses past data to predict whether prices are on their way up or down in the near future. The Affirm app offers a layaway option to you when you make online purchases. Based on your credit, you can pay an APR anywhere from 10 to 30 percent of the purchase. With layaway options at numerous merchants like Wayfair, Rooms to Go and Joybird, there’s no reason to wait to buy what you’d like as long as you can pay it back over time. For those who want to know the hottest deals currently available at big retailers, the BuyVia app could be your new best friend. You can use the app to track product prices and get notifications as soon as there is a price drop. You can also scan items to see which retailers have the cheapest price. Whether you’re looking to avoid fast fashion by buying secondhand clothes or searching for discounted designer goods at discount prices, Poshmark can offer up to 70 percent off retail prices. Download the app and browse what other people are selling from their closet including brands like Gucci, Lululemon, Tory Burch and North Face. Are you looking to save time and gas money? Boxed is the app that will save you both. It’s essentially a Costco for home delivery, where you order items in bulk and they are delivered free to your door if your order exceeds $49. Plus, there’s no membership fee! Do you prefer to save money by going to garage sales? Well, there’s an app for that — Yard Sale Treasure Map. The app does what it says on the tin. It finds nearby yard sales in your local area, even combing through events by keywords. Another way to save money is by browsing the Vipon app, which has featured deals ranging from electronics to toddler toys. They keep you up-to-date on the coupons you could be using right this moment while shopping in order to save you money. This is another great money saving app for iPhones. The GeoQpons app filters coupons by stores near your location. It shows daily coupons, sales and ads at your favorite retailers such as Old Navy or Target. You can also search nearby malls and find stores which are offering daily deals. Do you want something but can’t be bothered to pay for it? Listia is modeled after the old-school bartering system, where you can get rid of your own stuff for in-app credits, which you can then use to buy other items people are selling — all without spending “real” money, saving you cash in the long run. This one’s a bit different. The iTip Calc app helps you save money when you buy food. It calculates total bill costs and then splits the tab among all the guests, meaning you never have to overpay your portion again. Again, if you regularly shop for food — specifically at Sweetgreen — you can get free salad (up to $10 worth) if you spend over $100 within a year. If Sweetgreen is a place you already buy from, why not save some money with their app? Did you know that Starbucks has an app? Well it does and if you’re a regular, it could seriously help you save money. Once you accumulate 300 stars necessary to get Gold Status, then you get a free food or drink item every 125 stars, plus free refills! Download the Starbucks app today and get more of what you love for less! This might seem odd, but the restaurant chain Chili’s has a Chili’s app and it’s pretty awesome. Not only can you place to-go orders and reserve a spot in line, but you get a point for every dollar spent. Those points can then be redeemed at partners such as Macy’s and Rite Aid. Plus, when you sign up, they may give you free chips and guacamole. Save time and money with this app! Do you like eating out? OpenTable is an app that helps you make reservations at fine-dining restaurants. Every time you book a table through the app, you get points. Once you hit 1,100 points, you get a $20 reward at affiliates or a $10 Amazon gift card. Save money while buying food just by making reservations. Do you ever get to a store, find something you love, and price compare but already are annoyed by having to go to another store? Well, the Walmart app has a pretty cool feature — the Savings Catcher. You can scan your receipt and it finds comparison nearby. If there’s a cheaper price elsewhere they’ll pay you the difference in the store! Download the GasBuddy app today. It can search your local area and find the cheapest gas prices near you. If you use a GasBuddy card, it saves you five cents per gallon when you fill up. On average, GasBuddy says it saves the average driver around $340 a year! Save money while shopping by getting cash back. Just scan your receipt with the Receipt Hog app and you’ll get points for specific items you purchased. When the points add up, you can cash them out. Save money while buying the items you already wanted and needed anyways. Looking for more ways to make extra money? Try one of our recommended side hustles! Shoppers can compare deals from store to store, as well as search for sales via product name with the Favado app. You can also create lists based off of sale items you see and want, meaning you know exactly what to get when you arrive. Save money simply! Another grocery shopping app that will save you money, Grocery Smarts matches coupons with weekly sales at five major chains: Target, CVS, Walmart, Walgreens and Rite-Aid. 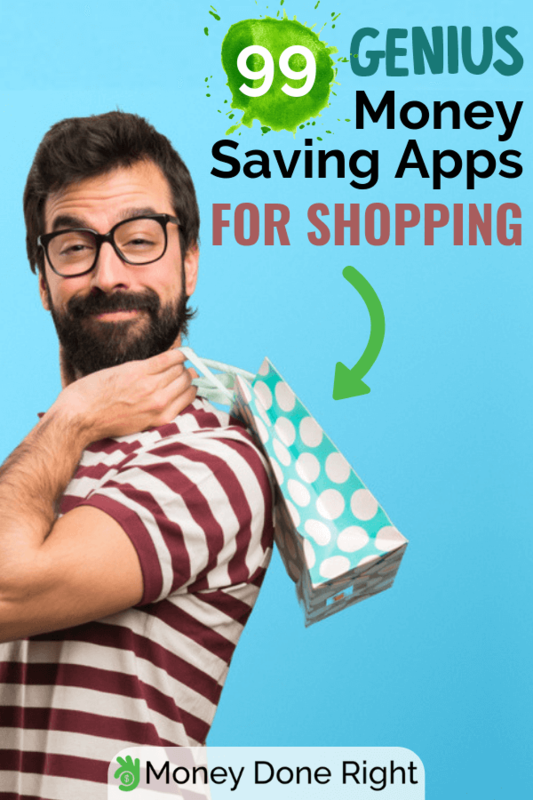 Looking for more money saving apps for shopping? Try MobiSave. It gives you cash rewards into your PayPal account for submitting a receipt. If your receipts are not itemized, you can earn 10 cents per specific item, while itemized lists will earn you $1 back per item. This is for coupon lovers out there. Smart Source is possibly the largely weekly coupon circular. You can filter coupons by product category or brand name. Find local offers by entering your zip code. Red Plum is a coupon circular in your local newspaper which is distributed on a routine basis. You can print or download the coupons then use them in store to save money. To save money when shopping for experiences or food, why not check out Groupon first for local deals? It can save you up to 70 percent! Similar to Groupon, Living Social offers discounts on local attractions and events as well as merchandise. Save on something you want with the Living Social app. To save money in various ways, give the Meetup app a try. It helps people find groups they mat be interested in. This may help you save money that you would have spent buying something if you join a group such as a clothes-swap group, book exchange group or a free yoga group. Who hasn’t heard of Craigslist? It’s the original save money site. In this instance, save money you would have spent shopping by downloading the Craigslist app for your local area and buying things or services for much cheaper. Amazon Coupons lets you look at all the current offers from every shopping category on Amazon. Amazing! Picture all of the savings. Looking for more tips on how to save money when shopping on Amazon? Check out our article. So, this isn’t a money saving app, per se. But it’s absolutely useful for shoppers. Connect with those you spend money with (family member, roommate, etc.) on Splitwise and add a note on how to split it. Then, the app tallies everything up for end-of-the-month balancing. Brilliant. Save money with Depop. When you search for clothes, don’t buy from stores, buy from others who are selling those same clothes at much less. Depop brings you the best options just a click away. Mercari is a resale app similar to Poshmark or Depop. It allows you to set up alerts for new items that match what you’re looking for. You can also get coupons for money off total purchase. Save money while shopping for clothes now! With a name like Krazy Coupon Lady, you know the app is going to mean business. This coupon app has a range of compatible store, including drug stores and grocery stores as well. It also pulls coupons from other sites as well, meaning this is your one-stop coupon shop. One of the more popular coupon apps, Shopular focuses on retail savings, especially in malls. You can use barcodes on your phone, which makes it easy for in-store shopping. Many brick-and-mortar stores also have online stores and their own money saving apps for shopping. Best Buy’s app keeps you up-to-date with current sales as well as mobile-only deals. It’s an easy way to save money on electronics. Walgreens also has their own app, which gives you weekly store ads which may not print in local papers, as well as excusive offers for those with the “mobile-only” version. The CVS app is essentially the same as the Walgreens app. It alerts you to weekly deals, gives you exclusive coupons and lets you create a shopping list so you can save while you shop. With a massive database of coupons, The Coupon App helps you save money by giving you daily coupon deals which are updated continuously every day. You can search for specific products, even by voice search. Want to save more money on your favorite brands and restaurants? The Best Coupons and Deals app allows you to sign up for exclusive offers or push notifications for hot deals. Make extra cash right now. Click here to see which of our recommendations best suits your life. Another money saving app is GrocerEaze, a grocery shopping app. It lets you shop by recipe, create your own shopping list and compare ingredient prices from nearby stores meaning your meal will be made from the cheapest local ingredients possible. Not only does the Food on the Table app allow you to create your own shopping list, gives you recipes to follow, tells you ingredients needed and the cheapest places to find them, but you can also add your own recipes and it remembers where your cheapest ingredients for that dish were. This website and app can save you a lot of shopping money at grocery stores. The Southern Savers app was created to help you stack savings via store promotions and multiple coupons. The Apples2Oranges app allows you to comparison shop the same items to find the best price. It can also help convert items that have different sizes. Save money with one of the best shopping apps for iPhone. Download the Spent mobile app to link your cards and get started saving money when you shop offers at favorite brands such as Starbucks, Amazon, and Uber. The CouponCabin app gathers a variety of money saving opportunities, such as coupon codes for online shopping, coupons for in-store shopping, as well as freebie and members-only coupons. The Supermarket Coupons app is a massive, searchable coupon database which operates like a search engine. It lets you search for items both by store and by item, finding the cheapest version possible. Another way to save money while grocery shopping, the My Grocery Deals app allows you to create a grocery list while simultaneously comparing deals at various chain grocery stores based on your location. Cellfire is known for giving instant savings to shoppers without the effort of needing to clip coupons. The service allows you to load e-coupons which can be used during checkout via your loyalty card. Click here for a lot more tips and recommendations on how to save more money! What are some of your favorite money saving apps for shopping? We’d love to hear your opinion so feel free to leave a comment below!